This blog was first published in the Global Policy Journal. With Kuala Lumpur’s congestion even disrupting the World Urban Forum, can the city turn the situation around and become a success story for improving transport systems? Irony? Well probably being late to an international urban planning conference due to being stuck in traffic is a good example. The chair did a sterling job of filling time as the audience eagerly awaited the speaker’s arrival. There was even an impromptu speech from an audience member to fill time as the cars inched closer in the muggy morning heat. Kuala Lumpur’s traffic issues are well known to residents here. A staggering 1000 cars are registered in Kuala Lumpur every day. This is largely a sign of Malaysia’s economic success in recent years, with people taking the opportunity to ditch the bus and instead drive themselves to work, whilst others are moving here for greater employment opportunities. Between 1985 and 1997, the use of public transport decreased from over a third of journeys in the city to less than 20%. 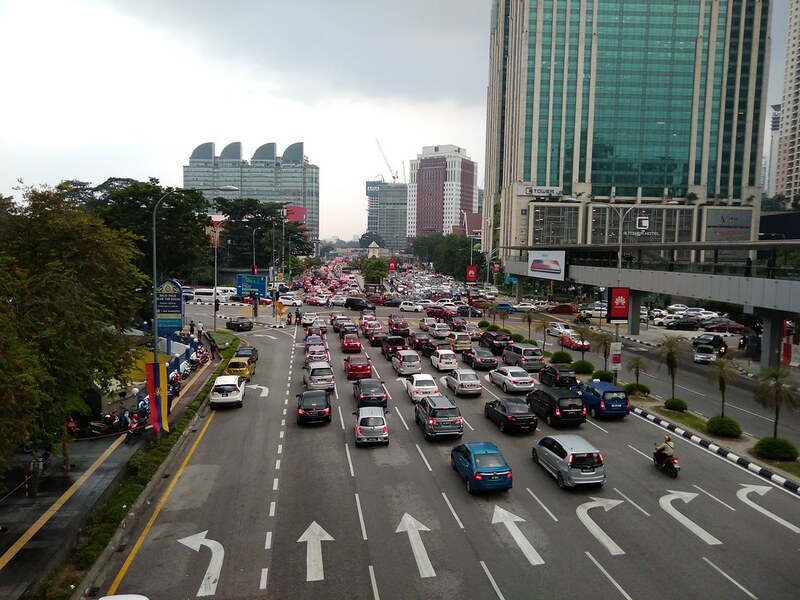 This increasing reliance on private vehicles along with steady population growth has led to the roads of Kuala Lumpur to exceed capacity and travel speeds to decline significantly. Along with the environmental impacts of congested roads, Kuala Lumpur’s economy may also be held back; productivity decreases, costs increase and employees may be put off from working in some areas of the city altogether. Other modes of transport have also been neglected in recent years, with a poor frequency and reliability in rail and bus services along with a lack of integration between the two. On the other hand, cycling on roads as congested as these would require nerves of steel – something I noticed from the airport as our taxi zoomed past a cyclist with just inches to spare. However, steps are beginning to be taken and improvements are being made. The Kuala Lumpur Structure Plan acknowledges that by-and-large, road capacity cannot be increased due to the lack of space between the sprawling metropolis and the rising skyline. Instead, emphasis in the Structure Plan has been put on attempting to create a “competitive, convenient, user-friendly and accessible” public transport system which is better integrated. Public-private partnerships are also being deployed. Chinese tech giant Alibaba is being tasked with establishing an artificial intelligence system that will use real-time data, images and videos to make adjustments to traffic light systems and ease congestion – a first outside China. Furthermore, to coincide with the World Urban Forum 9 conference, 12km of bicycle lanes have been launched to encourage greener, safer cycling across the city. The New Urban Agenda (NUA) which the World Urban Forum conference is focussed on will add pressure on Malaysia and other nations to tackle the congestion issue. The NUA encourages cities to use innovative technologies, strengthen sustainable transport including cycling and walking, and integrate public transport systems into future urban design to maximise its convenience and use in the future. Evidently, steps are being taken by authorities in Kuala Lumpur to make improvements to transport. If the city’s efforts prove successful in the coming years in curbing its addiction to the car, then it could become a case study for success for the NUA and transport sustainability. However, Kuala Lumpur has a long way to go to encourage its growing population to give up their cars and once again try the bus, walk or cycle. The city clearly recognises the issues and is taking steps to free up its roads. The NUA and the World Urban Forum draws further attention to the congestion issues, and could prove to be a useful incentive to improve urban living in Kuala Lumpur . The lateness of the speakers is a timely and poignant reminder of the significance of the challenge. So, if you come to a meeting or convention in Kuala Lumpur, maybe prepare a few words…you never know how much time you could be asked to fill! Michael Berry @SheffBerry is a final-year BA Politics student, having finished a year-long placement with the Civil Service as a Social Researcher. At WUF 9, he will be focussing largely on potential conflicts in policy goals between local and national governments, particularly around how the pursuit of economic growth may undermine urban sustainability.